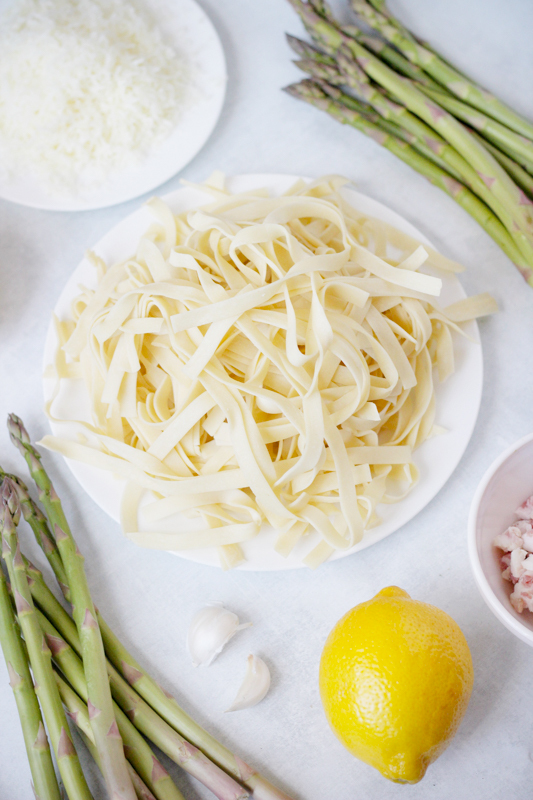 We are fully embracing spring today with this seasonal, light pasta featuring the season’s most famous vegetable: asparagus. It’s one of my favorites, and it’s one of Mazen’s too. Do you know why? “Because it makes your tinkle smell.” Sorry to bring up potty talk at the dinner table, but that is my life right now. Mazen thinks anything gross is hi-larious, and if it makes him a healthier eater, then so be it. 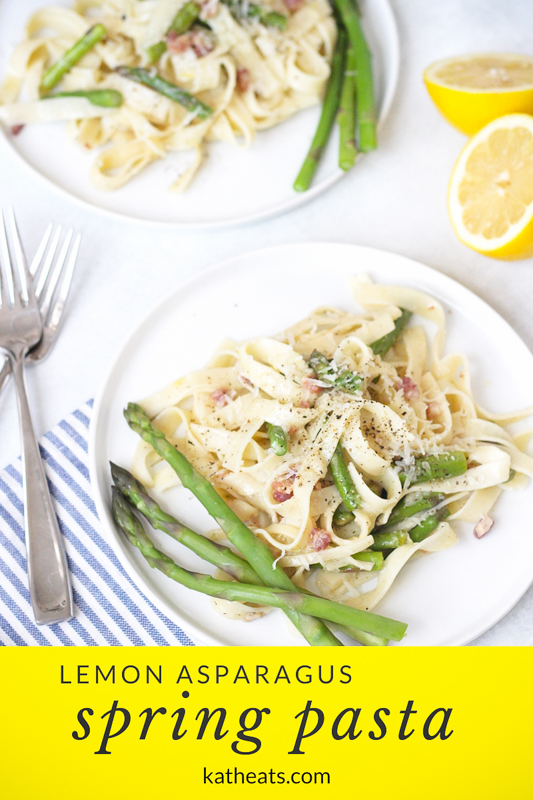 The recipe requires just a few ingredients – fresh lemon juice, olive oil, pasta water and cheese make a simple sauce. 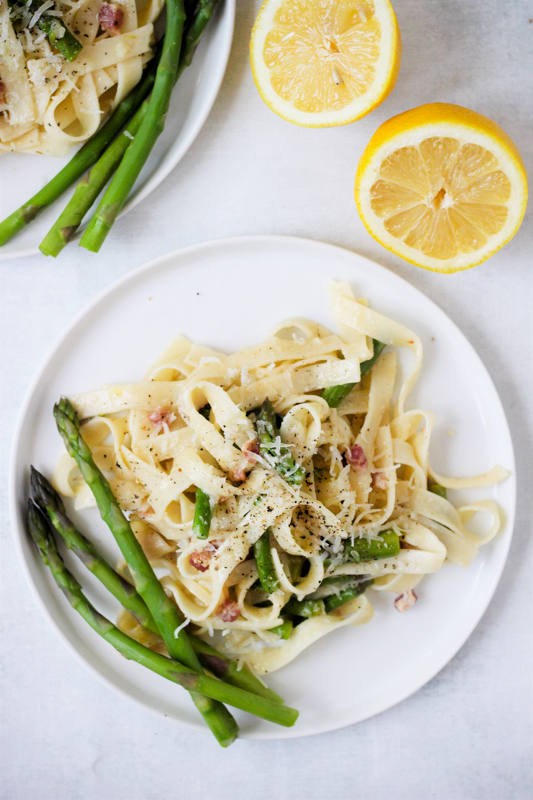 Meanwhile, asparagus, pancetta, and lemon brighten it up and bring lots of contrasting flavors to the mix. 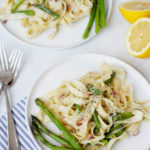 There are just a few easy steps: pan fry the pancetta, steam the asparagus, boil the pasta, then mix everything together. Don’t forget the cheese! Serve with some more asparagus or other fresh greens on the side and a little more cheese on top. Snap or chop off the bottom inch or so of the asparagus. 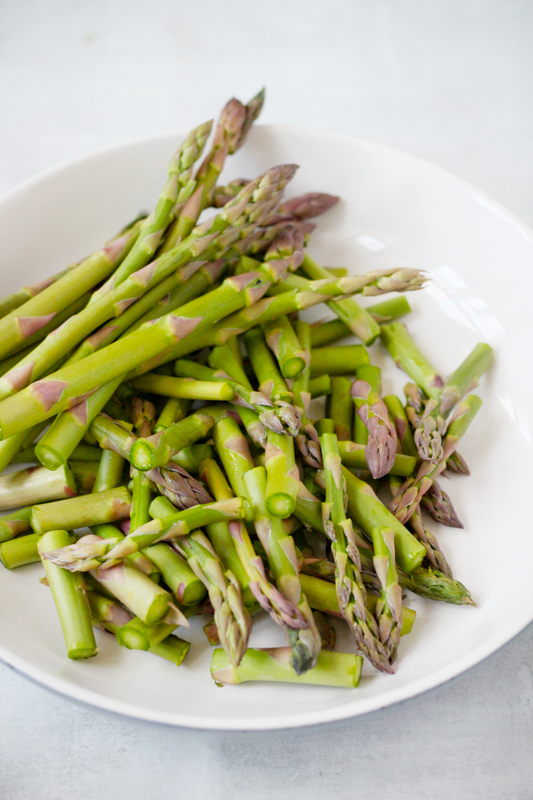 Cut the rest of the stalks of asparagus into 2-3-inch pieces. Mince the garlic finely or send through your garlic press. Cook the bacon or pancetta in a large sauce pan over medium heat. When it’s done (careful to not let it burn! ), remove with a slotted spoon and let strain on a paper towel line plate. Remove the grease from the pan, leaving just a couple teaspoons to cook the garlic. In the same sauce pan, reduce the heat to low and add the asparagus. Sautee for 5 minutes, until almost tender. Add the garlic and cook until fragrant, 3-4 minutes, being careful not to burn the garlic. Add the pasta to the boiling water and cook according to instructions. If using fresh pasta, it should only take 2-3 minutes for al dente. When the pasta is ready, reserve 1 cup of the pasta water to use for the sauce, then drain the rest. Add the pasta to the large sauce pan. Add in the olive oil, lemon juice, salt and pepper, stirring or tossing to combine. Finally, add in ½ cup of the pasta water, stirring until a nice light sauce forms. If the pasta looks dry, add a few more splashes of the pasta water. 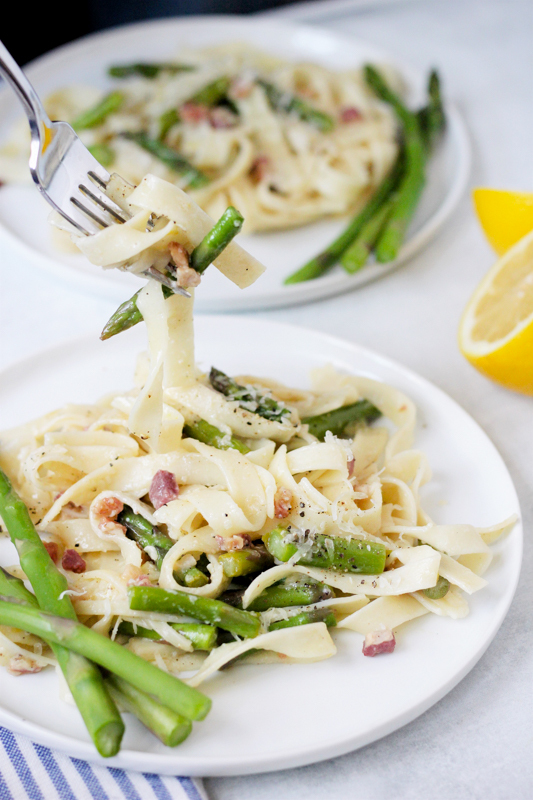 Finally, toss in the pancetta or bacon, asparagus, lemon zest and cheese to finish! 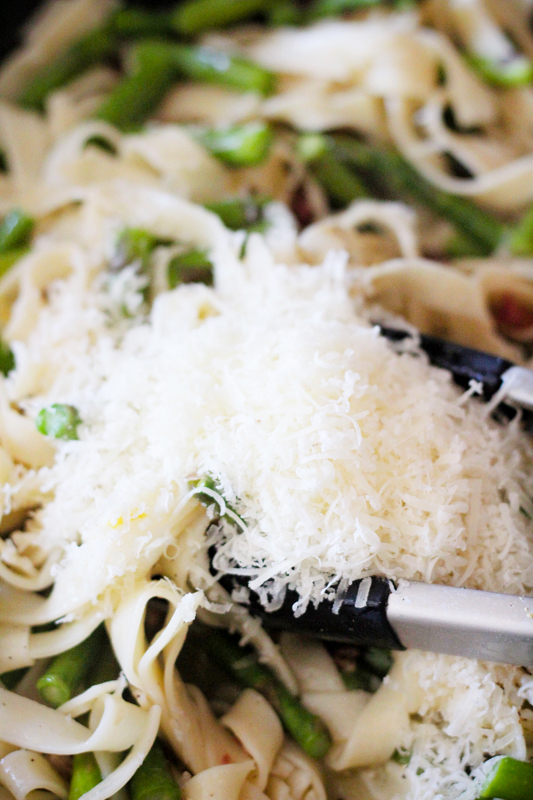 Sprinkle with more parmesan to serve. This sounds so good and perfect for the Spring weather! Definitely going to try this soon! That fresh pasta deserves all the heart eye emojis! 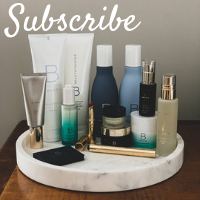 I love this combo – perfect for spring! This looks absolutely delightful! And so warm for the belly on cold, rainy, April days. 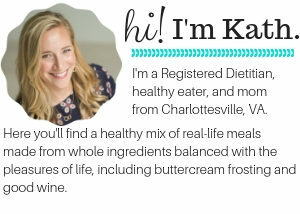 I love the simplicity of the recipe. I can’t wait to make it! ohh, never tried with the asparagus. The taste must be very good, I guess. Looks like a delicious pasta recipe. I love the fettuccine pasta. 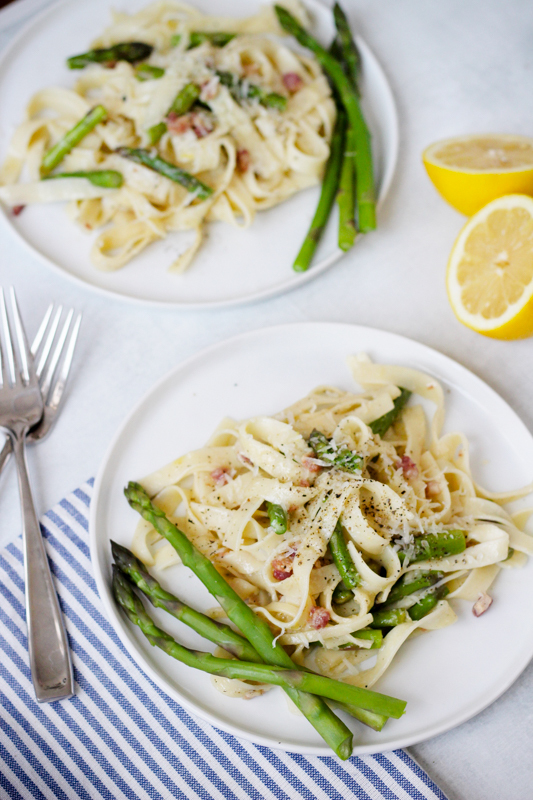 And I think Asparagus and Lemon make this recipe healthier. Thanks for sharing! The color and presentation looks amazing! Pinned and saved to try later.